That the Gospel for this Sunday, from the all-important Matthew chapter 16, coincides with the Holy Father’s pilgrimage to World Youth Day has to be providential. I remember signing up for World Youth Day 2005 in Cologne, Germany. My main reason for doing so was to see Pope John Paul II, who had been a great inspiration to me growing up. Unfortunately, in between my registration and the event itself, John Paul II died. I still went, and I saw Pope Benedict XVI, instead. Thinking back on it, though, there was really no difference. Simon & Linus & Cletus & Clement & Sixtus & Leo XIII & John XXIII & Paul VI & John Paul II & Benedict XVI all die. But Peter lives on. I went to see the Rock, and that’s whom I saw. The role of Peter—as our voice and our principle of unity—never dies. What a gift we have been given! What if we didn’t have his voice to teach us? What if we left it up to a democratic vote to determine what we believe? We can look at this Gospel and see for ourselves. 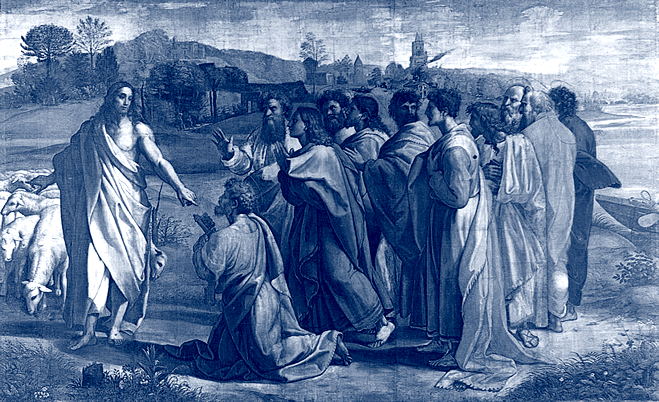 Jesus asks the Apostles to tell Him, “Who do people say that I am?” In other words, “What’s the general consensus about my identity?” And how do they respond? “Some say John the Baptist, others Elijah, still others Jeremiah or one of the prophets.” They give a wide variety of wrong answers. As then-Cardinal Ratzinger said: “Truth is not determined by a majority vote.” It was only Peter who gave the correct answer when he said, “Thou art the Christ, the Son of the living God.” So, Truth is Jesus Christ, and we need the voice of Peter to identify Him.